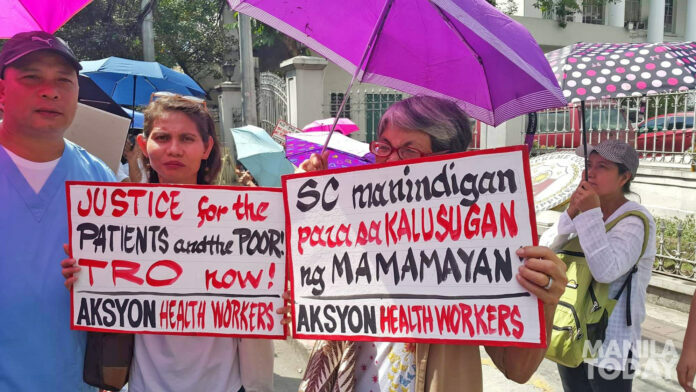 Aksyon Health Workers Party-list members and supporters trooped to the Supreme Court to submit their petition to be able to run in the May 2019 elections. Dr. Joseph Carabeo, president and first nominee of Aksyon Health Workers Party-list, said they wanted the Supreme Court to consider the voice of health workers, professionals and advocates and the patients. More than a thousand signatures were gathered from cities in the National Capital Region, from Cebu City and Iloilo City. They also launched an online petition that gathered 600 signatures of supporters in four days. Aksyon Health Workers Party-list’s accreditation to run for the elections this May was denied by the Commission on Elections (COMELEC) on January 17. The poll body said that Aksyon Health Workers Party-list failed to prove that it represents the marginalized and underrepresented sectors. “This comes as a mockery to the genuine party-lists that represent the people’s interests. The COMELEC readily approves party-lists whose nominees come from political clans and dynasties and who are most unlikely to represent a marginalized sector. Meanwhile, party-lists who are from and by the underrepresented sectors are brazenly shunned and denied based on petty technicalities,” added Dr. Carabeo. Administration-backed groups or those whose nominees were prominent figures of the administration were thought to have hurdled COMELEC scrutiny without much of a hassle. The Duterte Youth Sectoral Organization, who was seen in the last two years as a handful of pro-Duterte contingent in the big anti-Martial Law rallies, those during the burial of Ferdinand Marcos, Sr. at the Libingan ng mga Bayani (Heroes’ Cemetery) and the September 21 Martial Law rallies. AA-Kasosyo Party’s first nominee is former Presidential Communications Assistant Secretary Esther Marguax “Mocha” Uson.